Movie: "Superman IV: The Quest for Peace"
After escaping prison, Lex Luthor (Gene Hackman) steals and uses a strand of Superman's (Christopher Reeve) hair to create genetic material capable of growing his own super being. Lucky for him, Superman is helping the world's nations in disposing of their nuclear weapons by throwing them into the sun. Luthor straps the genetic material to a nuclear weapon, and when it is thrown into the sun, it grows the genetic material into Nuclear Man (Mark Pillow), a being just as powerful as Superman. 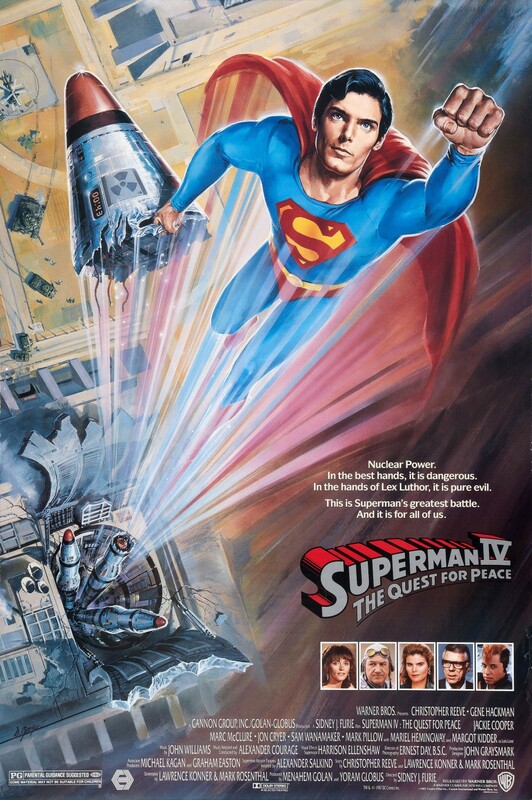 Superman tries to take on political issues such as the Cold War, the nuclear arms race, and sensationalist news reporting in "Superman IV: The Quest for Peace." Yeah, that sounds like a good idea! After the bit of a stumble in "Superman III," the series straight up crashes and burns in a horrendous, fiery death in this installment. With Gene Hackman returning to play Lex Luthor, you would think this was a step in the right direction. Unfortunately, Lex Luthor gets a new added sidekick in the form of Jon Cryer's Lenny, the nephew of Lex. Lenny is an unbelievably annoying character with a horrible, dude-tacular, 'righteous, man!' 80's style voice and manner. Returning are also Margot Kidder and Christopher Reeve as Lois Lane and Superman/Clark Kent, which, again, you'd think would bring this movie one step closer to the greatness it held in the 70's. All of the old faithfuls are still serviceable in their parts, but what they are working with this time around is a steaming pile of....well, you know. In addition to gigantic budget cuts, there are a few main plot lines going on here, one being that the Daily Planet has been bought out by a tabloid who only cares about money and profits and returns. They don't care about hard hitting news anymore, they only care about what sells. This leads to a series of events, including a bit of a smear campaign against Superman and his unwillingness to do something about the nuclear arms race. This, in turn, leads to Superman's campaigning against nuclear weapons as he shifts his focus from helping people and fighting villains to helping countries disarm themselves by collecting all of the world's nukes and throwing them into the sun. THE SUN, people!! Let's set science aside on this one since Superman is an all-powerful being from space in the first place. We can suspend our disbelief about a lot of things, but this plot line simply screams desperate. When Superman does this, it allows Lex Luthor to fulfill his plan of making Nuclear Man, played by Mark Pillow, the solar powered super villain with radioactive, long, silver finger nails, which are, coincidentally, the same ones I have purchased at party stores for Halloween several years in a row. I guess it's comforting to know we shop at the same place as big budget movie studios! Also added to the cast is Mariel Hemingway, who plays Lacy Warfield, the daughter of the man who bought the Daily Planet. Lacy takes an huge interest in Clark Kent, while Lois still has an interest in Superman. Clearly this creates the opportunity for a silly dinner scene at which Lois and Superman are supposed to double date with Lacy and Clark. Of course, the makers of this film don't even try to tone down the zaniness, reducing Superman to a terribly constructed love triangle no one asked for. And if you're wondering what happened to Lana Lang from "Superman III," stop wondering. She's completely out of the picture and there is no explanation given whatsoever for her absence. It's little missteps like this, the subtraction or addition of details without explanation, plus the huge missteps like adding the goofy Jon Cryer and omitting key elements about Superman and his abilities (who knew he could transfer his powers of flight to Lois Lane without a word?!) that makes this movie a complete and utter trainwreck. The success of first two films is long gone by now, and Superman has been reduced to a cartoonish shell of himself, bumbling his way out doors and windows to try and impress two different ladies. UGH. The biggest downfall of "Superman IV: The Quest for Peace" besides its ridiculously disjointed story and lots of behind the scenes troubles is the villain. Nuclear Man is just so, so stupid. His outfit (nails notwithstanding, of course) is a little more than outrageous. The Superman movies of yore could pride themselves on having somewhat decent antagonists for Superman to throw down with, but the finale of this movie is horrendous, laughable, and embarrassing all at once. On top of this, since the budget of the film was slashed significantly, the special effects are the same laughably, shockingly bad mess throughout the entire thing. Despite coming out nearly a decade after the original "Superman" movie, the special effects somehow manage to look worse than they did in the original film, which is saying something for a movie that came out in the same era that produced movies like "Star Wars." Unless you want to punish yourself, there's really no reason to watch "Superman IV." Stick to the good memories the first two movies produced and avoid the last two. One year ago, we were watching: "The Hobbit: An Unexpected Journey"